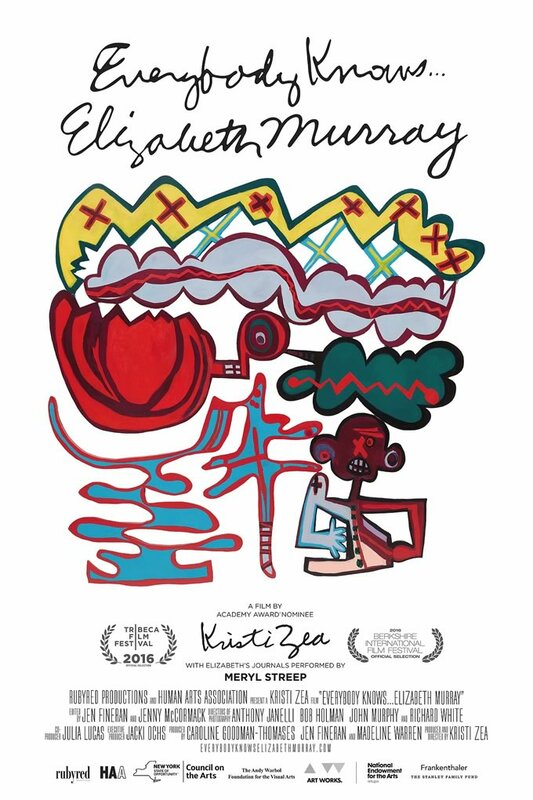 Everybody Knows…Elizabeth Murray is an intimate portrait of the groundbreaking artist Elizabeth Murray. This film explores the relationship between Murray’s family life and career, and reconsiders her place in contemporary art history. Verité footage, home videos and excerpts from her journals, voiced by Meryl Streep, tell of Murray’s internal struggles and incredible ambition. Exclusive interviews with art world luminaries provide the historical backdrop for the New York art scene. Elizabeth Murray moved to New York City in 1967. In 2005, almost forty years later, Murray was the fifth woman to be celebrated with a retrospective at the Museum of Modern Art in New York City. Everybody Knows… Elizabeth Murray traces Murray’s life, from years as a struggling single mother to having a bustling, growing family and thriving career. From her early 1960’s “funk-inflected pop” to her painterly minimalism in the 70’s, and on to her dynamic fractured canvases of the 1990s and 2000s, Murray worked without hesitation through – and often in spite of – market trends, historical movements and her failing health. Murray’s paintings defy efforts at categorization. She broke convention, and made an indelible imprint on contemporary art. This film chronicles her remarkable journey from an impoverished childhood to artistic maverick, before she lost her life to cancer in 2007. Everybody Knows… Elizabeth Murray cements Murray’s legacy as one of the great painters of our time. Everybody Knows…Elizabeth Murray is co-production of RubyRed Productions and the Human Arts Association. When I met Elizabeth Murray in the late 80’s, we were part of a small group of women who went out into the wilds of Utah for a week or so once a year to ‘dish and download.’ We all had blossoming careers, and needed to express our needs and frustrations in a neutral and nurturing environment. We would hike during the day and talk about our lives, sharing our secrets, our fears and our joys. Most of us were artist- moms and we wrestled with similar conflicts of career and family. Inspired by the documentaries of my colleagues Martin Scorsese and Jonathan Demme, it became increasingly clear to me that a film about the life and work of Elizabeth Murray was essential. Her untimely death in 2007due to cancer underscored my desire to share the precious moments I have spent with Elizabeth. This documentary will also be an effort to raise awareness about the “basic sexism” of the art world. Through Elizabeth’s story we hope to shine a light on all female contemporary artists who havenot received as much attention as their male counterparts. In addition, we will explore what it means to be a “successful artist.” In what terms do wedetermine the value of an artist’s work. This hour-long documentary celebrates the life and work of American painter Elizabeth Murray and assimilates her into our cultural literacy. I am thrilled that the film premiered at the Whitney Museum as part of the 2016 Tribeca Film Festival and will be seen around the world! My only sadness is that Elizabeth isn’t here to enjoy it.